Great recipe! 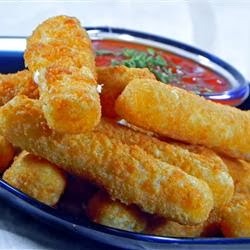 These fried cheese sticks are very easy to prepare and sooo good.. Let them sit before serving and it's own heat will continue to make the cheese soft. In a large heavy saucepan, heat the oil to 365 degrees F (185 degrees C). One at a time, coat each mozzarella stick in the flour mixture, then the egg mixture, then in the bread crumbs and finally into the oil. Fry until golden brown, about 30 seconds. Remove from heat and drain on paper towels.